A Northshore Barn Door is a handcrafted work of functional art. It is living history, with woods and components that can be up to 300 years olde! Reclaimed wood from olde barns, houses, and out-buildings are handcrafted to make beautiful artisan barn doors for homes, bars, restaurants and retail spaces. Each Northshore Barn Door we craft is unique: we design, hand-build, and custom install each and every door. We specialize in rustic, olde boards — with cracks, with character, with style built-in — that cannot be replicated anywhere! In fact, we don't really think a door built from new wood that has been stained or painted is really a true barn door anyway. That's just not what we do. The wood we use is generally aged pine grades. Our wood is picked from outdoor and indoor building sources like olde barns and houses, sheds and wood stacks. Most wood has been exposed to the elements for decades or even centuries. Wood that was reclaimed from inside olde homes taken from flooring or walls may have been exposed to the elements for a very long time. This can change some characteristics of wood. Our wood is not kiln dried, but it is brought to and stacked inside our Amesbury shop which is very dry and heated in winter. Whenever stacked, we space the wood boards with "sticks" between layers to allow for airflow. This ensures that the wood being used to create your doors is as dry as possible during assembly so no warping will occur. The Barndoorist comes to see your space to get a feel for what might work and listens to you and your design desires. Then he selects wood from the shop to design each door, board by board. Every piece is considered for placement in a puzzle that can only be unlocked through true passion. This magical process transforms a pile of olde wood into the beautiful piece of art that will compliment your room. Boards are selected and cut so as to fit together just right as the door comes to life in the shop. Olde nails may be pulled or left in, knot holes may be filled or remained untouched, boards are cleaned and rasped and wire-brushed, and toasting or waxing may be applied accordingly. The door is completed in the shop and awaits its new home. The Barndoorist can help you design any patterned barn door. We can mix, match, or reverse any of our common door designs. Do you wish you could have a handcrafted Northshore Barn Door, but have a small space, an odd corner, or just a unique challenge? Well we’ve got Unique Solutions! 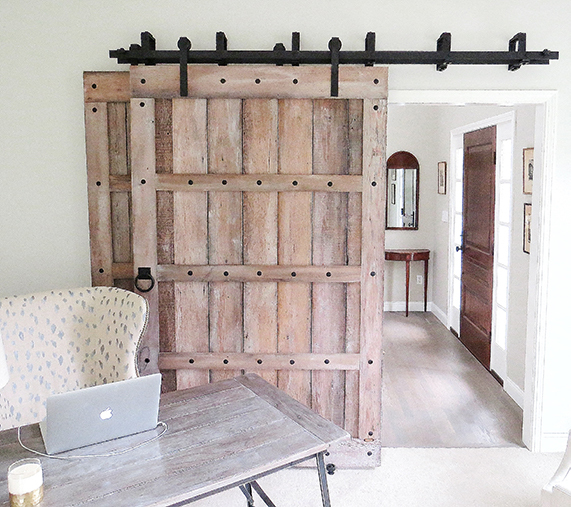 Your Northshore Barn Door lives on your wall. That's our philosophy when we install your door. The Barndoorist sets up tools and equipment and readies the space to receive art. If ply backers, headers or brackets are being installed, this is done with professional care and quality carpentry. Rails are put up with spacers customized for each project. The moment when a door is first hung on its rail to try out is a special transformation for that room. And once it is set in place and any tweaks are worked out in this process, its new life begins. Some doors labor easier and quicker than others. Door birth is a unique experience for every barn door, whether this is a first-time installation or part of a set, or if you are a repeat customer. Sometimes the door installation comes through really fast. Other times, well, not so fast. 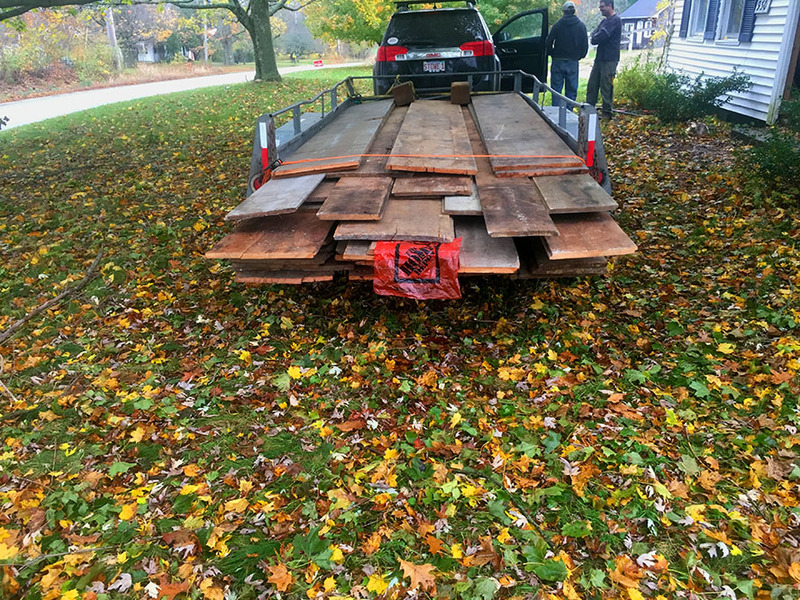 How quickly your door and final joy arrives depends on many things, including how fast something called Barn Door Labor is happening. A door is never truly finished until the last touch up tweak is done at the end of its installation and our logo plate is put on at the base of the frame. It is only then, at this moment, that the connection between this olde wood and this finished door transforms from the Barndoorist's hands into the new space it shall live with its new and excited owner! Like olde time carriage makers, we build functional art! My barn doors are handcrafted to be functional, but they are also a form of art. They are each one of a kind. Sure, I can make two or maybe three doors look alike or be similar — if being used in the same room or hallway space — but this also depends on whether I have enough of the same lot of wood and if they are made at the same time. This is because much of the wood I source is from olde buildings and barns and its rough pine nature cannot be easily found. Each door is a uniquely crafted piece and is built to be different from any others I've previously made. I retrofit most barn door parts and I also make my own, depending on the size, weight or style of the door being created. The wood is mostly rough pine — I rasp and wire-brush every edge of each and every piece — and I also clean the boards as I assemble your doors so they can be a part of your interior space and serve as beautiful functioning pieces of art. Like art, both feeling and real design consideration pour into the character of each door being built for your needs. I am sure you will enjoy the doors! — Jeff Filipov, Northshore Barn Doors Founder, "The Barndoorist"
Thank you for contacting us. The Barndoorist will get back to you within the next 24-48 hours. Copyright © 2017 Northshore Barn Doors - All Rights Reserved. Northshore Barn Doors, LLC is a woodworking business registered in Hamilton, MA and with the Commonwealth of Massachusetts. Fully Insured. Northshore Barn Doors does not sell or share any customer information with anyone!